For more information, email Rose Meier or call 907-474-6935. Website services provided by Alaska Sea Grant. "Networks: from nature to society"
4/2/15: The current conference schedule [PDF] has been added. 3/24/15: The banquet date has been corrected to Thursday, April 16th. Applications for travel funding are now available. The meeting times will be from 9:00 AM to 5:00 PM on Wednesday and Thursday (April 15 & 16, 2015) and 9:00 AM to noon on Friday (April 17). A detailed schedule is now available. Online registration is available. Registration fee: $60 Participant $30 Student (ID number required). Need-based scholarships will be available on a case-by-case basis. Email Zach Fansler for more details. The WAISC banquet ($40) will be the evening of Thursday, April 16. More details including menu and location will be posted soon. Soap-making—Thursday afternoon. Cost: $30 (new reduced price! ); maximum 10 participants. Natural dyes—Wednesday and Thursday afternoons (total 4 hours). Cost: $35; maximum 10 participants. Hosted by the Kuskokwim campus of the University of Alaska Fairbanks, the 2015 Western Alaska Interdisciplinary Science Conference will bring together researchers, Elders, educators, students, community leaders, and community members; to share concerns and insights about issues relevant to rural Alaska. This conference is a platform for reporting on and discussing regional research efforts as well as traditional knowledge, providing an interdisciplinary approach to inquiry and discussion. At this conference we will explore connections between humans and the environment—to begin to better understand the unique networks that exist within and around communities in rural Alaska. We invite those who have an interest in any aspect of life in rural Alaska to join in this gathering, because we value each perspective that attendees bring as an integral part of the network. We are all coming to realize that we are stronger and better able to move into the future when we cast a wider net—sharing across disciplines/generations/geographic location/cultures. In addition to regular and paneled sessions, this conference will include a banquet (Wednesday, April 16th) and workshops on traditional uses of plants, including natural dyes and soap making. Organizers welcome submissions from all individuals and organizations working (currently or considering) on research projects in rural Alaska, and to any others who already call it home. The Winter Bear Project and Drew’s Foundation will present The Winter Bear, a play by former Alaska Writer Laureate Anne Hanley. 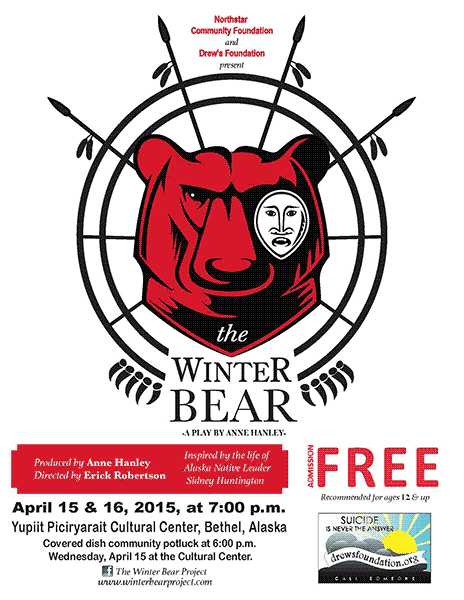 This production tells the story of an Alaska Native teenager who rises above the traumas of his past to become a leader with the help of mentor Sidney Huntington and a Winter Bear. All are welcome, and admission is FREE. Website hosted by Alaska Sea Grant. • Contact: Alaska Sea Grant web coordinator. • This page is HTML5 and CSS3 validated.